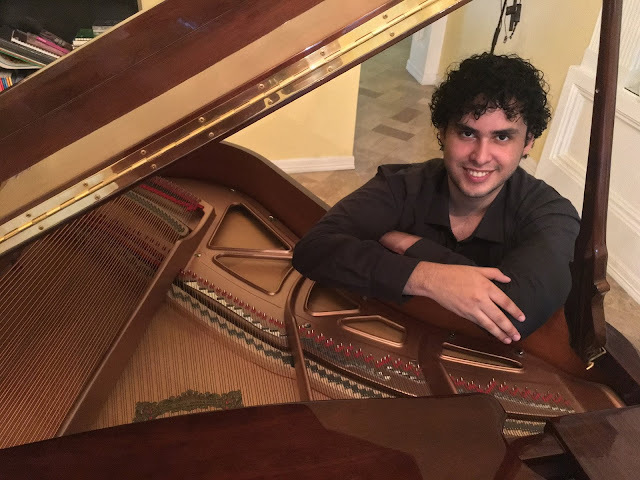 He began his profesional piano studies in 2014 at Autonomous University of Nuevo León in Mexico, studying with piano faculty chairwoman Dr. Antonina Dragan. He has also enriched his pianistic development through the study of the Taubman approach to piano playing with the internationally renowned teacher Edna Golandsky, and through the valuable instruction received in masterclasses from concert artists such as Alexander Paley, Pavel Nersessian, Vitaly Pisarenko, Jura Margulis, Mauricio Vallina, Sean Duggan, Dimitri Rachmanov, Niel Immelman, Enrica Pellegrini and Jonathan Shames. Bermudez is a winner of international piano competitions in Russia, U.S.A., England, Austria and Mexico, where he has also won local musical analysis and composition competitions and published articles in music related magazines. He has developed his career playing in the most important theaters and auditoriums of his locality, and participating in international piano festivals and symposiums at important universities like Princeton University (USA), Oxford University (UK), Philadelphia University of the Arts (USA) and Autonomous University of Nuevo León (MX). Bermudez is currently is the first and only person in Mexico and Latin America to be part of the Professional Training Program of the Taubman Approach to piano playing from The Golandsky Institute (New York, USA), being mentored by the world leading expert Edna Golandsky.